It’s a jungle out there – Save 25% on our Jungle and Safari SALE! Don’t monkey around fancy friends! 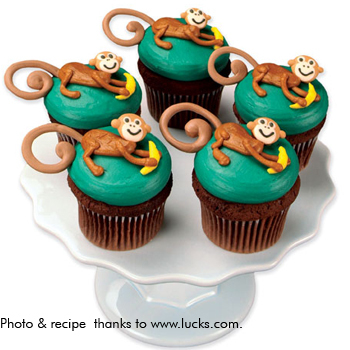 Take advantage of our 25% off sale this week – featuring several jungle and safari themed items including these adorable royal icing monkey faces. Sale starts today and runs through July 11th at fancyflours.com. Discount is taken at checkout! Try this fun cupcake project too – the adorable swirly tails are make from melted candy melts and piped onto wax paper! Use hard candy bananas or if you have the time, pipe your own. Read the full recipe and instructions HERE.